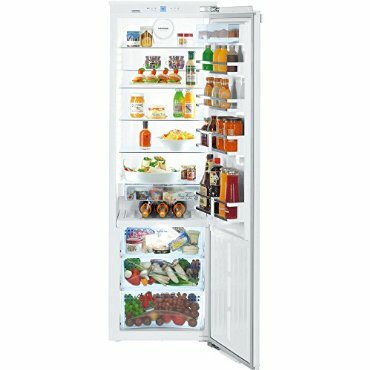 The 24" Liebher All Refrigerator has a 10.9 cu. ft. capacity and has the BioFresh and SuperCool features that stores certain fresh foods up to three times longer compared to other refrigeration system by chilling the storage just above freezing to retain most of its nutrients, flavor and texture. The LED light column allows for the interior to be completed illuminated for the best view of all of your storage and the NoFrost system allows for safe and long-term freezing and defrosts automaitcally, so you do not have to manually defrost the unit. With option to activate BioCool, you can switch to the highest refrigeration power to cool down large quantities of food rapidly in order to maximize the amount of nutritional value kept. The BioFresh Compartment allows you to store certain fresh foods up to three times longer compared to conventional refrigeration system, without sacrificing quality. This allows for the preservation of important nutrients while keeping foods from spoiling and losing water. The NoFrost system defrosts the appliance automatically so that you do not need to deal with the hassle of manual defrosting. Our engineers invested a great deal of effort in developing our SoftSystem hinge, ensuring the doors of select Liebherr models always close gently. At 30? in built-ins and selected European fully integrated models, SoftSystem takes over for you and closes the door without slamming, even when the interior is fully loaded. Full Two Year Warranty: For two years from the date of original purchase, your Liebherr warranty covers all parts and labor to repair or replace any part of the product which proves to be defective in materials or workmanship. Full Five Year Warranty: For five years from the date of original purchase, your Liebherr warranty covers all parts and labor to repair or replace any components that prove to be defective in material or workmanship in the sealed system. The "Sealed System" means only the compressor, condenser, evaporator, drier and all connecting tubing. Limited 6th through 12th Year Warranty: From the 6th through 12th year from the date of original purchase, your Liebherr Warranty covers all parts that prove to be defective in materials or workmanship in the seal system (parts only). Coupon Details: Get $210.00 OFF automatically when you add this item to your cart! Regular price of $3209.00 will be shown prior to adding it to your cart.